When I moved to the San Fernando Valley, which is part of Los Angeles, California, in 1986, the air pollution was terrible. The air was always brown, and the mountains could only be seen on rare clear days, like after a rain. Efforts had already begun to try to get air pollution under control in Los Angeles, but it really hadn't shown much, except that it made people angry that they had to follow a lot of new rules, such as having their cars inspected for emission controls. The air pollution devices that had become popular in the 1970s were pretty easy to remove, and so the state enforced laws requiring their use. Nowadays, when I visit there, I am amazed at how clear the sky is. People wonder if I am kidding, as it's still pretty dirty, compared to the blue skies of Minneapolis, or Phoenix. But it is so much better! Even before the suburbs started growing in the San Fernando Valley, it was a windy and dusty place. My research has shown that apparently the thought was that once trees were planted that the dust and air pollution would be gone. The trees would take care of it! Well, it didn't really happen that way. Of course, now attitudes about air pollution have changed dramatically. Pollution controls on cars are taken for granted. There are even very strict pollution controls for buildings. When I lived in the valley, there was more of an attitude of freedom, which included having a car that belched out smoke, and just plain not letting the government tell you what to do. 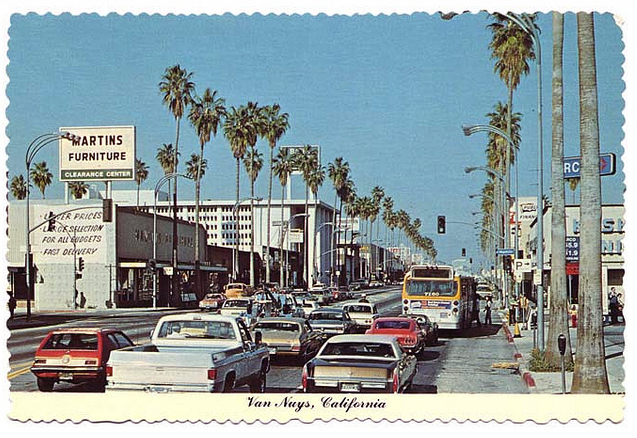 Los Angeles was all about "doing your own thing", not behaving in a communal way. That was for places that were crowded, like San Francisco. The valley was a wide-open place, with lots of room, and you could do what you wanted, which included taking off the pollution controls on your car, which just affected performance and gas mileage, anyway. I like blue skies and clean air. That's part of the reason that I left Los Angeles and moved back to Phoenix. And then I watched Phoenix start to have to deal with the same problems. Luckily, pollution controls are so tightly woven into how modern cars work that they really can't be disabled, and people don't even think about it.